Malkin Bowl is the outdoor performance stage in Stanley Park and has hosted Canadian musicians such as Broken Social Scene, Blue Rodeo, and The Tragically Hip. 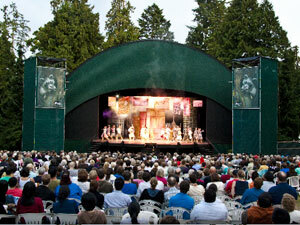 The Marion Malkin Memorial Bowl, or Malkin Bowl, is an outdoor theatre in Stanley Park, Vancouver, British Columbia, Canada. Built in 1934, it was originally a two-thirds-size replica of the Hollywood Bowl. Allard de Ridder, then conductor of the Vancouver Symphony Orchestra, was largely responsible for convincing W.H. Malkin, a former mayor of Vancouver, to build the theatre as a summer concert venue for the VSO. Malkin endowed the theatre in memory of his wife. Check Malkin Bowl for upcoming events! This entry was posted in Stanley Park Info and tagged Events Vancouver, Malkin Bowl, Park Vancouver, Parks Vancouver, Stanley Park, Vancouver Events, Vancouver Park. Bookmark the permalink.